Long day... need to unwind after a hectic workweek?... Come get the royal treatment and enjoy the royal "all about you" treatment we provide at our spa. Our packages are a must try and you will be pampered, cared for and totally relaxed. 1. The hammam begins with the visitor dressed in a pestemal (body towel) in the steam room. This is important to accustom the body to the heat. 2. The next step is the detoxification uncovered by the pestemal, the skin is rubbed with an organic black olive soap. 3. Kese: In this stage the pestemal is put to one side. The skin is rubbed with a special peeling glove (kese). The body is then rinsed with lukewarm water from the fountain (tafadna). 4. Uncovered by the pestemal, the skin is rubbed with pure argan or olive oil. 5. Enjoy tea or juice and some bites in the relaxation room. The Rhassoul from Morocco, comes this remarkable natural source, reddish brown cosmetic clay known as Rhassoul. It has been used for over 1400 years as a soap, shampoo, and skin conditioner, and the finest spas across the globe currently utilize it for therapeutic benefits. Mined deep beneath the Atlas Mountains in Eastern Morocco it must be extracted under extremely special conditions. Through meticulous selection, and extensive contact with the raw material we are proud to offer this rich Rhassoul that is truly unique in quality and purity. When first mined, Rhassoul clay appears as a polished brown, soap-like clay, which is chunky in appearance and resembling rocks. After further refinement and micronization, the end product is a smooth almost silken earth. Because Rhassoul can be used for a variety of professional applications, it is an invaluable enhancement for spa treatments and for personal use. It can be used as soap, skin conditioner, shampoo, and facial and body mask. As Rhassoul contains higher percentages of silica and magnesium along with potassium and calcium than other clays, Rhassoul appears to be far more effective. In addition to this, due to its greater smectic qualities, Rhassoul achieves better results in skin treatment. After a you will smoothly rub volcanic ash clay on your body. 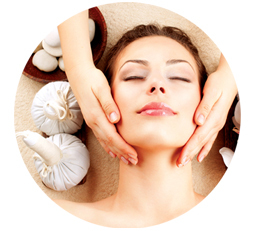 The nutrients found in naturally occurring clay softly penetrate the skin. The profound charm of hammam. The softness of foam is perfect for a wonderfully relaxing massage. 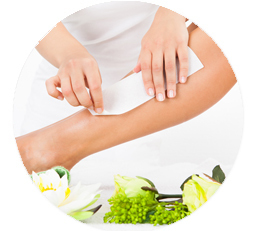 Waxing done at our spa is quick and as painless as it gets! Wherever you need wax, we make you as comfortable as possible.